A month after his debut album, Cole World: The Sideline Story, hit stores and eventually went on to reach number one on the Billboard charts in its first week, J. Cole continues to ride high. The rapper from Fayetteville has had many great, well-deserved opportunities come his way recently thanks to his chart-topping success and Roc Nation support. But I'd like to go on the record as saying the reason J. Cole is having the Best Week Ever (remember how VH1 used to do it?) is because on Wednesday, Beyonce the Great debuted her new video for "Party" and J. Cole has a featured verse and appears in the video. 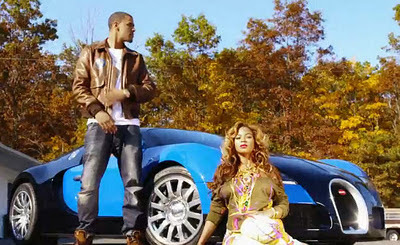 The version of the song in the video is actually a remix of sorts, in that J. Cole has replaced Andre 3000, who appears on the album version. There are all kinds of rumors circulating as to why the reclusive Outkast rapper didn't appear in the video--and his name was a trending topic on Twitter for two days because of it--but his omission has been to J. Cole's advantage. And I don't think it would be a stretch to say that Mr. Cole World benefited from the fact that his label boss Jay-Z is married to Beyonce. Nevertheless, J. Cole shined during his brief verse and appearance in the video. The "Party" video has averaged more than a million views a day since debuting, and I have to say that I'm loving the song and video. It just puts me into a feel-good mood. Even though Beyonce has no reason to go to a trailer park other than to shoot this video, she captures the spirit that people can have a good time and enjoy life even if they don't have a lot by society's standards. Keep up with J. Cole at www.jcolemusic.com. What's up with Occupy Charlotte?